What if you had spent years searching for something elusive, something you believe existed that most didn't, and then one day you finally happened to capture it on film? What would be your immediate next steps if you wanted to present it to the world? In the days before instant media uploads to the internet, where would you take the film and who would you show it to first if you wanted to be taken seriously? 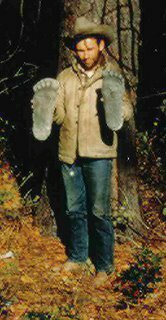 Roger Patterson had thought he and Bob Gimlin had captured irrefutable proof of Bigfoot, next to bringing the beast itself out of the woods. Little could he realize that every action and claim going forward from that moment of filming would be analyzed and criticized for the rest of his life, in addition to his integrity. Whether out to prove authenticity or a perpetrate a hoax, in either case, the reaction to the film was predictable. From the few scientists who bothered to look, to the curious public, some believed, some scoffed, some didn't know what to think. What we know now from Patterson and Gimlin's story, is that indirect evidence is not enough for most, you need to produce a body, but even then there are those who will refuse to believe. What we also know is that for Patterson, and in turn Gimlin, providing this film as evidence turned out to be much more trouble than a benefit and much more than they bargained for. Realizing what these men went through, if you were to one-day capture extraordinary evidence, would you think twice about sharing it? Code Names. Deception. Gadgets. It might seem like something out of the movies, but these are just some of the essential components of being a spy. Most spies don’t stand out like James Bond and Ethan Hunt. They are ordinary, forgettable people, which makes them all the more dangerous. So what does it really take to be a spy? Every week, the Parcast Network’s original show Espionage explores this high-stakes world and analyzes the missions behind the world’s most incredible spies and what brought their covert operations into the public eye. Find out the real-world spy tactics required to impersonate, exploit, and infiltrate the most confidential places in the world. You’ll be shocked by the episode on Larry Chin, one of the CIA’s top Chinese linguists who was also China’s top spy for over thirty years. Search for and subscribe to ESPIONAGE wherever you listen to podcasts. Search ESPIONAGE or visit Parcast.com/Espionage to listen now! Ethos – You may feel like you’re healthy and in your prime, but the truth is, no one lives forever and if you have loved ones who depend on you, what’s your plan for them in case something happens? The responsible thing to do is make sure everyone’s covered and Ethos Life Insurance is here to help, with affordable, comprehensive coverage and an unparalleled customer experience. Signing up is easy and takes just 10 minutes online – you can even do it from your phone. There’s no pesky paperwork, mind-boggling Fine Print or pushy sales people. Ethos treats you like a person, not a risk. They work to make sure you can choose the right policy that fits your needs, lifestyle and budget. And there’s a dedicated Customer Support Team located in the U.S. to help with any questions you may have. To get started, visit ETHOSLIFE.COM and click “CHECK MY PRICE” which will guide you through the online application, and for most people it only takes about 10 minutes to get your estimated rate! Don’t wait to make sure your family’s financial security and their future is safe, no matter what. Episode 140: The Patterson-Gimlin Film Part 2. Produced by Scott Philbrook & Forrest Burgess; Audio Editing by Sarah Vorhees Wendel; Sound Design by Ryan McCullough; Tess Pfeifle, Producer and Lead Researcher; Research Support from the astonishing League of Astonishing Researchers, a.k.a. The Astonishing Research Corps, or "A.R.C." for short. Copyright 2019 Astonishing Legends Productions, LLC. All Rights Reserved.